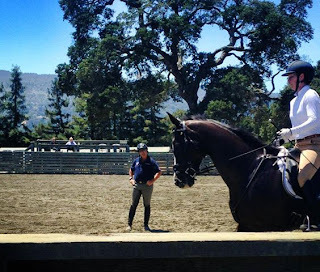 This past weekend I was lucky enough to be part of David O'Connor's West Coast training sessions in Woodside, CA. Located at the Horse Park, we had three full days of Dressage, Show Jumping, and Cross Country. The second night featured a beautiful dinner, hosted by Victoria Klein, and a discussion lead by David about the direction of the US Eventing Team. His passion for the team was evident in his words, as was it evident in the care he took to instruct each and every rider/horse combination to his fullest ability. Mr. O'Connor certainly did not shrink away from a long day and he expected his riders to have the same fortitude when it came to receiving his instruction. Things were kept running smoothly by Joanie Morris, who was always accommodating to schedule changes and requests. I am deeply grateful to have been invited to participate not just with Billy, but also with Tim. I think I can safely say the three of us grew immensely and look forward to showing David our new and polished moves a few short days from now in Montana at Rebecca Farm. The theme of the weekend was improving the riders' skill set. This may seem self evident, but if you think about it, most clinics are about improving the horse. While David is surely interested in the horse's learning curve, he was much more adamant that the rider take responsibility. He believes that by creating better riders, the horses will naturally follow. The added pressure of everything being the rider's responsibility was exactly what most of us needed to perform at our best, as there were certainly no excuses to be had! I, for one, heard a lot of, "Repeat. Repeat. REPEAT!". And an occasional, "Good." and even a, "Perfect." once or twice. You had better turn up your hearing aid with David if you want to hear the compliments, because he is there to improve you not to make you feel like a genius on horseback. Billy was very excited to be at a "show" again, since he hasn't been out since Jersey, though his exuberance was not totally appreciated on the first day which was meant for Dressage. He held it together though, with no real outbursts, and even kept his composure when David rode him and asked for his compliance. 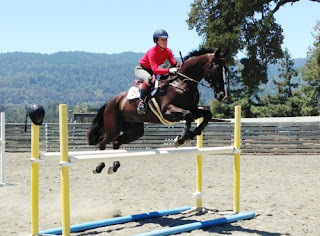 We hadn't jumped much to speak of since Jersey, so Billy welcomed the bigger fences and the challenging exercises. Though the third day was meant for cross country, Billy and I were able to sneak in another Dressage lesson. 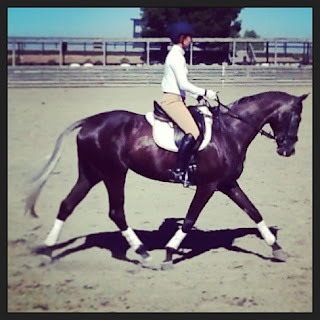 It was with great reserve that Billy worked through his Dressage paces, showing vast improvement over the weekend. Tim was an absolute super star for David. At just six years old, he has felt quite ignorant at times in his training until this very weekend. He must have known to rise to the occasion, because he was focused, supple and light, and eager to do as I asked without resistance. All three of his phases felt strong and I can't wait to show him at Rebecca. The West Coast Eventing circuit is a close knit group, with everyone feeling like family and supporting each others endeavors. The camaraderie at the training session made the weekend feel like one big Summer Camp for grown ups... grown ups with the common obsession of horses! Get Your Team DF Gear! !